Interests - Loves the X Factor, music, (likes Cher Lloyd, Katy Perry, Little Mix, loves One Direction, Jessie J etc), musicals, Glee (becoming a real Gleek! ), horse riding, playing on her laptop i.e. build a bear games, Guides, Disney princesses especially Cinderella, dressing up, reading (about horses, fairies or princesses), Wizards of Waverley Place, Sabrina the teenage witch, iCarly, Mortified, Disney Channel and Pop Girl, shows like Good Luck Charlie, Pretty Little Liars. Eleanor was born with several life threatening conditions – Muscular Dystrophy, Cardiomyopathy, Severe Dystonia, Peripheral Neuropathy, Arthrogryposis and Multicystic Kidney Disease. Eleanor, (Elle as her friends call her), has constant therapy and trips to the hospital several times a month but still tries to do everything she possibly can. Eleanor uses an electric wheelchair as she can only walk a few steps and is due to have foot surgery soon. Due to her deterioration, Eleanor will be having brain surgery in the next few weeks in the hope of easing some of her symptoms and delaying the de-generation of her condition. Although she gets breathless and very tired, Eleanor tries to join in with her friends and has extra feeds through a gastrostomy tube to help her get more energy (she does love eating normally though). Eleanor struggles with most daily activities as she has muscle weakness and erratic body movements but she does everything with a smile. We have decided that Elle should move on from Post Pals as she is doing so well. Eleanor always finds the summer holiday difficult, as she wants to do the things she see’s other children enjoying, but her pain is preventing her from doing much. She is listening to lots of music instead to make her smile. 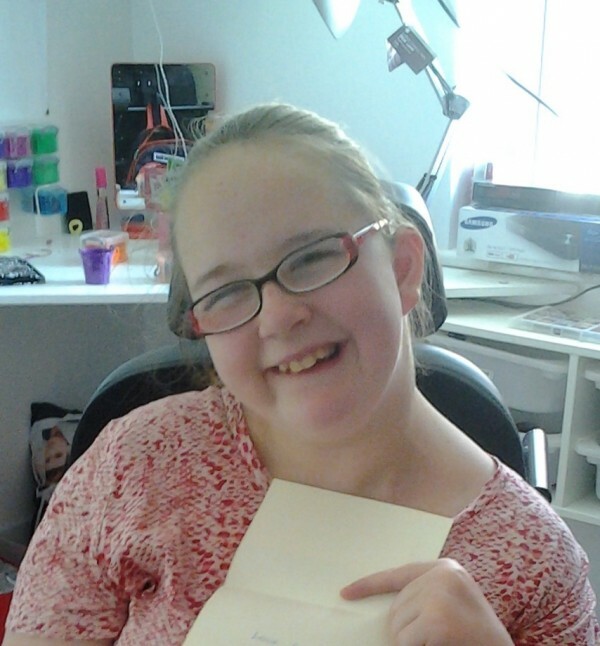 Eleanor would like to say a big thank you to Kym who sent her a box of Sunshine which had a lot of gorgeous personalised items in that clearly were made with a lot of love and care. Daniel would like to say thank you to Em from Isle of Man. He said you make him so happy when he gets your letters and parcels. Both Eleanor and Daniel say thank you to Post Pals for their lovely goody bags. Eleanor is doing OK at the moment. She is getting tired quickly but luckily being a teenager means she can just chill out on her iPad and listen to music. We are awaiting results from her sleep study to see if her oxygen has reduced any more during the night, but her heart is doing well on her current medication. Thank you so much for our amazing paper cuts, they are taking pride of place in Daniel’s room and our living room. We will take a picture of them! Also a massive, huge thank you to Connor for Daniel’s birthday card. It makes his day when he can see it’s from you Connor. You are an amazing and caring young man. Eleanor is still having lots of tests and investigations at the moment. Her pain levels seem to have improved with new medication, so hopefully she will be comfortable for the forseeable future. This month is going to be a busy one with lots of travelling and hospital visits. We would like to say a huge thank you to Em from Isle of Man who regularly writes to both Elle and Dan and makes them smile so much. Elle’s health is yo-yoing at the moment. She is generally doing ok but is finding things harder and more tiring because her speech and concentration is affected. She cannot go horse riding anymore so is now more into her cats and dog. She loves watching Glee and Pretty Little Liars on Netflix and has got in to watching teen films with her sister Georgina. Eleanor is going into hospital at Kings on Monday for more surgery, this time on her chest as her dbs box is not working. We are hoping to be transferred from Kings to Demelza house children’s hospice on Wednesday for recovery and home Sunday. Elle is still in love with One direction and is very music orientated now that she is no longer mobile at all. 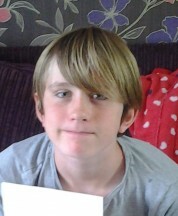 Dan is now becoming very grown up (or thinks he is!) and he is still in love with Pokemon/Digimon and things like adventure time/regular show from Cartoon Network, but is now also very interested in reading and is enjoying things like physics at school. Elle has had yet more tests over the last couple of months and her oxygen seems to be dipping at night, so more investigations into that are underway. We also saw Elle’s orthopedic surgeon as Elle has been in lots of pain and unable to even transfer out of her chair. Unfortunately he has discovered that both hips are out of their socket and one hip has worn considerably. This means we are now due to go on another London hospital trip in the next week or two for Elle to have more tests under anaesthetic to see what kind of operation they will need to perform to help her. We were also contacted by Elle’s geneticist a few days ago who said they want to test for another rare gene. So all in all, a busy few weeks in our house. Elle is getting through the pain by doing her usual thing of listening to music while bossing everyone about! Georgina (Elle’s sister) and her friend Hannah have organised a charity event for Post Pals which is on the 9th August and even printed flyers, bless them. Hopefully they will raise a lot. We have a few London hospital trips coming up for Elle to look into her further movement/mobility deterioration over the last year, but she is otherwise doing well. Elle is very much enjoying her music, as now that her mobility is greatly reduced and she is wheelchair bound, she is spending her time listening to all the popular chart music. She is now also into watching Glee as loves musicals and wants to visit a stage show sometime in the future. Eleanor is coping very well with her loss of mobility, we are having to reduce a lot of things she used to do and get her to rest more but she is as smiley as always. Eleanor had a lovely package sent to her from 1st Clifton Brownies. The parcel contained 24 numbered envelopes to be opened each day in December. Elle has opened two so far containing a lovely homemade hama bead star and a flag with her initials on. What a fabulous thing for a Brownie group to do. Eleanor will be enjoying her handmade advent calendar and we will be taking pictures to make into a collage for the Post Pals website. Thank you so much 1st Clifton Brownies for a whole advent of smiles! Also a big huge thank you to Connor for Daniel’s parcel, he loved it, you got it exactly right! And thank you for Zara and Georgina’s yummy chocs! It has been a difficult few months for our family as Eleanor is deteriorating, luckily at a slow rate, but still enough to be upsetting. Elle now cannot walk at all and a recent scan showed damage to her left hip. After several assessments in London, Eleanor’s consultant has come to the conclusion that her tiredness and general weakness is due to the degenerative nature of her condition and was unfortunately expected when she reached pre-teens. We have now been advised to be prepared for the future and currently looking into more support and equipment for the home. Alongside this, Eleanor’s mum has been poorly and is about to have several surgeries. Georgina, Eleanor’s older sister, is being a completely fabulous young carer and helping to care for her autistic brother while mum and Eleanor have their various hospital trips. Thank you to Connor and Karen. Daniel loved receiving post from ‘his mate Connor!’ And thank you Laura J as Eleanor was so impressed with her 1D Chocolate, she was giggling for ages. The support that Post Pals gives to the whole family, not just the named child, warms my heart. Our family will always be grateful and appreciate every single piece of post sent, no matter how small. Had bit of bad news today. Elle’s orthopaedic surgeon told us that her hips are damaged, the bone has grown deformed, and so she has now got to reduce her crawling and will be wheelchair bound pretty soon and need an intensive operation. We’re so sad, she loves her independence. Georgina (Eleanor’s older sister) would like to say thank you so much to everyone for all the post she has received since Eleanor has been a Pal, but feels that now she is older she would like to stop receiving post so that other children have a chance at smiling as much as she has from it! Eleanor is settling into her specialist school very well and it has done her confidence the world of good. She seems to be a little less tired as she is not trying to keep up with all the able children like she was before. Eleanor’s condition continues to deteriorate, although thank goodness it is very slowly. She is no longer walking at all and becoming increasingly dependent on equipment but is trying as always to be as independent as she possibly can. Eleanor is absolutely obsessed with One Direction now, especially Harry Styles, and is more into listening to music and playing on a laptop now. She’s becoming more teenage-like daily! She also loves to watch Pop girl, Sabrina the teenage witch, Mortified and Disney programmes, Victorius and i Carly. Post Pals has picked us up and made us smile when we felt that life had got too much, please never underestimate the joy you can bring by supporting Post Pals. Eleanor started to deteriorate a few months ago and now has unfortunately lost her ability to walk and stand unaided. She is taking things slower as she is becoming tired very quickly so now spends most of her time listening to music or on her computer. She was due in hospital for a few days of extensive tests to find out why she is deteriorating at such a rate but unfortunately the appointment has had to be cancelled and is re-scheduled for the end of November. Eleanor now attends a specialist school as she was unable to keep up in mainstream, but she is very happy and has made lots of new friends. Elle’s main interest at the moment is X Factor, she is a huge fan and loves everything about it. She is getting more and more into music now and dreams of meeting Cher Lloyd but also loves Katy Perry, Little Mix, One Direction, and Jessie J. She is also a big fan of Disney channel and Pop Girl shows like Good luck Charlie. She is even trying to make her own videos using her phone camera! Eleanor is having some tests to find out why her condition seems to be deteriorating. She is very lethargic and struggling a lot but is still being a cheeky little madam! Thank you for all our post and a special thank you to Em from Isle of Man for sending all 3 children post regularly – lots of smiles created by one person. Eleanor has had a really difficult and busy few months; she had her operations on both feet and spent the whole of the summer holidays in plaster casts… which she charged people to sign for Post Pals! In the last few weeks Eleanor has had constant trips to hospital in London and is struggling a bit with tiredness and breathlessness, but is still carrying on doing all the things she loves with a smile! Due to Mum being quite poorly and in out of hospital too, it has been quite hectic for the family, so apologies for late replies. Thank you so much to Denise Cannadine for the Worst Witch books. Eleanor is still X Factor obsessed, but is also now enjoying her sister reading her Harry Potter and the Worst Witch. She is really getting into music too and is a huge Katy Perry fan! Eleanor has had some deterioration over the last few weeks and has been struggling quite a bit, so we are back and forth to Evelina children’s hospital for heart tests, neurology etc. Elle is going to have more surgery on 26th July. Her feet have become severely deformed and we cannot get shoes to fit her anymore so they are operating on her feet to make her more comfortable. We are unsure if she will be able to walk after the operation, but she has proved us wrong before so fingers crossed! Elle also has a new obsession! Talent shows… Xfactor, Britain’s Got Talent etc, so if anyone wants to write to her and talk about these types of shows she would love it. Daniel is doing well at his new specialist school and has a real thing for Dr Seuss and Harry Potter and Lego at the moment. Georgina is being a real star and coping with all the stress really well. We had a few tears the other day when we were staying at Demelza House because I think she has just begun to realise what a hospice is, but she is getting support from the Demelza House team. She is really into story writing and reading and has written her own novel! We will be coming to the Post Pals party on the 25th June and can’t wait to meet you all! I would like to say a huge thank you to all at Post Pals for the immense support they have shown us during these hard couple of months. Eleanor is doing well. She unfortunately missed her last review at hospital but will catch up soon I’m sure. Eleanor had a bit of a blip after her operation and kept collapsing. After being put on some new medication she seems to have perked up and we are going to see her doctor on 14th December to see how things are. We have had a few low moments this month but we’re getting into the Christmas spirit now and would like to thank everyone who has sent post! You can be having the worst day imaginable, then get home to some post from Post Pals and realize you can still smile as people do care! Just to let you know Eleanor has had her brain surgery and is back home again. We thought she would be in hospital for quite a while but it was decided that she would be better off recovering at home away from bugs etc. We just got home today and she is doing well. Her Post Pals pillow case has been a great comfort to her. Elle has had her surgery and is doing well. She is in and out of consciousness but being very brave. Eleanor G went down to surgery at 8.30am. We are now twiddling our thumbs waiting and hoping she will make it through. Thank you so much to everyone who has sent her post. YOU GUYS ARE ALL AMAZING! 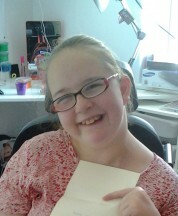 Elle is going into hospital on the 11th October to have brain surgery. She will be in Kings College hospital for 1-2 nights and then will be transferred to Evelina children’s hospital where she will be recuperating for a couple of weeks. She will have quite a bit of recovery to do at home as well before she can go back to school or join in with her friends but we are hoping the operation will slow down the degeneration of her condition and give her some better quality of life. Elle is very nervous but had a great time on Sunday when several people got together for a sponsored head shave to support her when she has her hair shaved off. Eleanor loves her amazing smiles that come from miles! Daniel and Georgina have received some beautiful home-made cards, thank you so much to everyone for thinking of the siblings too, they are going through such a tough time at the moment and it is lovely that they are thought about as well. Elle would like to say a huge thank you to everyone who has been sending her letters, she loves reading about your day and seeing pictures of pets etc, it really has made this time in the run-up to her operation much happier. A huge thank you for the rainbow bandanas!!! As Elle will be having her hair shaved on Monday this will be her prized possession for a few weeks! Also, a while ago Eleanor was sent a cuddly horse with a voucher to name a star; it was such a lovely thoughtful gift that really made her smile! I would encourage anyone who wants to fundraise for a charity to pick Post Pals as they do so much for many many families!!! We are seeing Eleanor’s brain surgeon at Evelina on Friday and Eleanor will be shown the implants that will be going into her brain and assessments will be made ready for surgery. Eleanor is taking her Build-A-Bear everywhere with her, thank you so much Dan and Jen, she is even looking forward to taking it to hospital. She has named her bear Cinderella! Eleanor is going to put a map up in her room so she can mark off where she gets post from, she is very excited that she has received post from different places and can’t wait to show her friends. Eleanor will be having her brain surgery on the 12th October. She will be at Kings College Hospital on the 11th for admission, have the surgery on the 12th, and then will be transferred from Kings College to Evelina Children’s Hospital on the 13th for a 2 week stay and then further recovery at home. She will be having her head shaved on the 11th too, which is quite scary for her. Thank you – you guys are amazing.